JSON-LD Structured Data is a standard way to annotate your content, so that machines can understand it. When your web pages include structured data markup, Search Engines can use that data to index your content better, show it more prominently in search results, and surface it in new experiences like voice answers, maps, and Google Now. 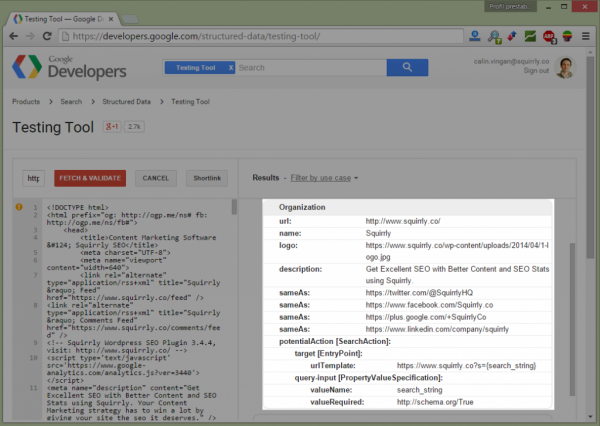 Squirrly will automatically add the JSON-LD Structured Data in your site for both Organization and Personal data. I set Json+LD but it didn´t work. The articles worked but not the pages. How can I try to solve this problem? If your pages are using a custom post type. Go to Squirrly > Settings and check that post type. If Squirrly loads and only Json-LD isn’t, then please send us an URL so we can check. Great I have just downloaded this plugin, hopefully waiting to see results. I created a new WordPress site and optimised 7 posts using Squirrly and within 2 weeks my site was on the first page of Google for a dot-com domain name. Excellent. Awesome. Don’t forget to build backlinks and social signals to these articles so that Google will keep them on top for a longer time.